The inaugural interim show for Chelsea’ newest Fine Art course, the Graduate Diploma, took place last week in the Cookhouse Gallery. Sometimes it can take a little while to realise that Fine Art is your calling and to take the leap into a Fine Art degree. 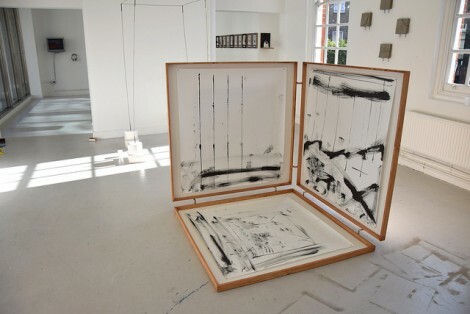 Many students at Chelsea come to study art after having started careers in various other professions such as architecture, medicine, literature or law, whilst all the time creating and making pieces in their spare time. The Graduate Diploma in Fine Art is Chelsea’s newest degree course and aims to help this transition from one career to a new fine art-based practice. Last week’s show was the first opportunity for the public, as well as Chelsea staff and students, to see works by students on this course. We caught up with Fine Art Graduate Diploma student Ben J Hartley who told us about the experience of creating the show with his peers. This is the first interim show you have done for this course. How did you find the experience? Many of us were really excited at the prospect of showing in the Cookhouse, and it was mixed with some trepidation: this was Chelsea’s first “proper” Grad Dip Fine Art show. We needed to do our best as a lot seemed to be at stake – not sure what exactly! Now that it’s over, I think that was for good reason – we received lots of interest and support, such as from the students on the MA Curating and Collections course, who were amazing. Curating a group show can be challenging, especially with so many different styles of work- can you tell us a bit about how you did it? Yes, we all decided not to give the show a name other than Interim as we are still such a diverse group of artists. We have all come from a mix of careers and educational backgrounds. You have people from a healthcare background like myself, philosophers, financiers, lawyers… it was never going to be a predictable show! 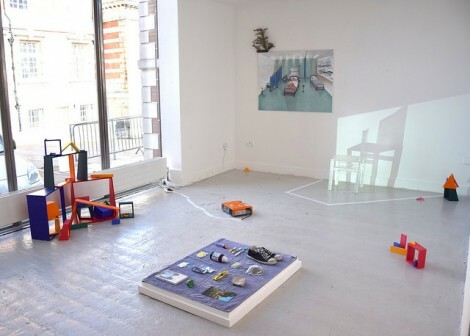 That said, we did find some synergies when curating the show – such as some “ritualistic” approaches to making, and more fragmented approaches to showing such as my own. We had a week to set up and needed all of that time. 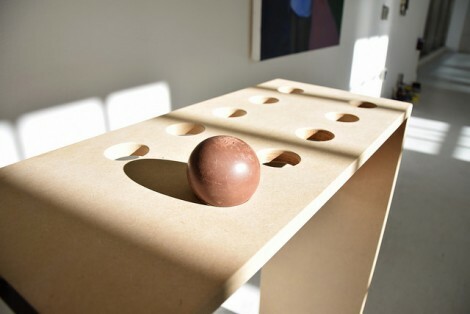 It seemed, in the end, most work was arranged around a few “anchor” pieces – works that needed a certain amount of floor space, for example, or those that we wanted to place near to or opposite each other as it seemed to create the right “conversation” or “flow”. Can you tell me a bit about your work in the show? Was the set up easy? 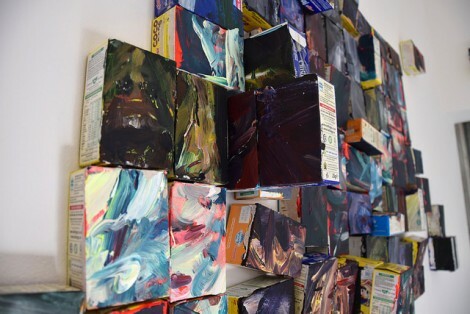 I exhibited a work made up of used mini-cereal boxes. These were originally painted as three larger quite personal representational pieces, which I broke up in the way that only this smaller sized box could allow when using the brushes I had chosen, to make a new composite object. This process reflects my interest in modulation, deconstruction, chance and abstraction, as well as the idea of the throwaway and everyday in life. Despite how it may have looked it was easy for me to set up. I basically started in the centre – where it should have been had it been one piece, and worked outwards. I started making more complex decisions, such as putting various “modules” (painted mini cereal boxes) up high, or cheekily invading another space. It reflected my mood at the time: excitable! 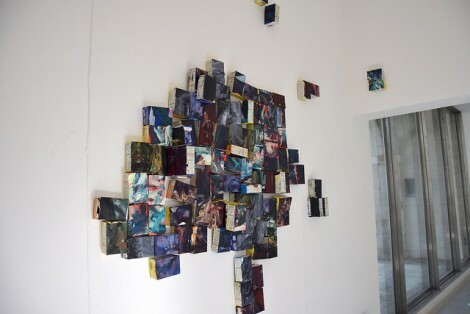 It was important for me that each module became a painting in its own right – that was why I did them, to depersonalise a larger more representational painting (which they all once were part of). Thinking of each piece individually made me slow down and make more careful decisions. The placement seemed to come to a natural end, so the rest I piled on the floor and invited other people to do what they wanted with them. Some are a bit damaged, and possibly some missing, but that’s ok too! You spent the week of the show in ‘crits’, where you go around the exhibition as a group of students and tutors and discuss each piece of work. For someone who has never experienced a crit before, how would you describe the experience? How is it helpful? Crits are hard things to get used to. Sometimes I feel really nervous before one, and other times totally at ease, or at least more at ease once I get over the initial shock of being centre of attention – just you and your work. They are very democratic, and mostly good natured. My favourite format is letting the viewers speak a bit about what they are seeing, before I start talking about the work. It’s amazing to hear how differently your work can be interpreted, and on how many levels. See more of Ben Hartley’s work on his website. See more images of the Interim Graduate Diploma Fine Art Show. For images of the set up, private view and crits, please visit Storify, where Ben Hartley and fellow student Sarah Porter documented the exhibition.